The Summer Shorts festival at 59E59 is, according to the theater, “tailor-made for summer viewing.” While that language may make audiences expect frivolous or undemanding material, the three plays included in Series A of the festival, are, in most cases, just the opposite. Among the offerings, there’s gut-wrenching emotional drama and heady philosophical debates, failing relationships and profound grief. While summer is indeed a great season for relaxing and unwinding, it’s also a time of year when audiences may have the head space to dig deep and take in challenging theater. While Series A is not an unmitigated success, there’s plenty to enjoy for the thoughtful summer theatergoer. The poignancy of Melissa Ross’ Jack sneaks up on you. Her protagonists, at first, are immediately unlikeable, and their quibbles, initially, seem trivial. But in the span of about half an hour, her characters and their concerns grow increasingly three-dimensional. We find George and Maggie in a city park in the midst of a heated argument about a missed phone call. This seems overblown until the true nature of their dilemma finally reveals itself. They are divorced, and the dog, Jack, who split his time between the two of them has died. As George and Maggie, Quincy Dunn-Baker and Claire Karpen are cloaked in anger right off the bat. When the armor falls away, however, they are both jarringly real and raw. 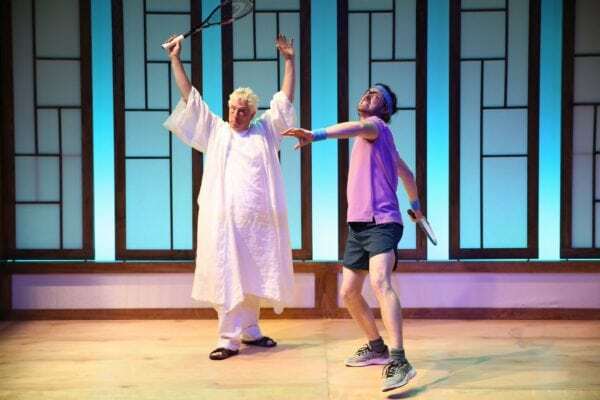 Director Mimi O’Donnell keeps the ping pong at the top of the play brisk, and then brings the action down for an emotionally formidable landing. The dead dog, Ross cleverly decides, isn’t the tragedy, but the pair’s destroyed marriage. Her show, ultimately, is about what possibility for kindness remains in the aftermath of a relationship. The exploration is simultaneously dispiriting and hopeful. Like the god of the Bible, the deity in Alan Zweibel’s Playing God doesn’t much appreciate the hubris of human beings. In this scenario, the object of his wrath is an arrogant, atheist obstetrician, Scott Fisher (Dana Watkins), who has flippantly decided to reschedule a pregnant woman’s delivery to accommodate his vacation plans. Rather than strike the offender down, God (Bill Buell) decides to pay him a visit on Earth, without revealing his identity, and make a believer out of him through—get ready for it—his supernatural squash-playing ability. The laughs stem from Fisher’s ongoing disbelief in the face of such almighty power, and they may very well satisfy those who readily accept Zweibel’s unskeptical, God-fearing premise. But the play doesn’t offer much for non-believers. Buell is a fine Larry David-like schlub of a God, and Fisher makes a believable jerk, but the script doesn’t leave either of them any room to grow or change in their roles over time. Like so many Bible stories, God gets his revenge and the errant man gets his just punishment. Some extra complications would make the tale more satisfying. If you like Ayn Rand, you’ll probably like Graham Moore’s play, Acolyte. If you can’t stand Ayn Rand, you’ll still probably like it. That’s both a testament to Moore’s writing ability and to the talents of his cast members, who play Rand’s husband Frank O’Conner (Ted Koch), the Objectivist philosopher herself (Orlagh Cassidy), and two of her acolytes— Barbara Branden (Brontë England-Nelson) and her husband, Nathaniel Branden (Sam Lilja). After a party in Ayn and Frank’s apartment one night in 1954, a theoretical, philosophical argument turns very real and, in the vein of Who’s Afraid of Virginia Woolf?, things get heated and complicated. A mid-century set by Rebecca Lord-Surratt and costumes by Amy Sutton create a stylish atmosphere for the action. Moore’s script is sharp and surprising and director Alexander Dinelaris lets his words shine. There aren’t any big twists here when it comes to Moore’s treatment of the famous philosopher, and that’s just fine. Rand is an explosive enough figure as she is, and when she plays puppeteer with the lives of others, as she does here, the results are mightily engaging.